Has Netflix revealed itself to be another deep state conscript? 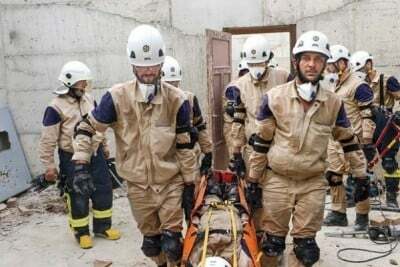 The recent Syria White Helmet promotional movie has caused uproar among people awakened to the US, UK state and intelligence agency involvement in this pseudo ‘first responder’ faux NGO outfit that has infiltrated Syria on behalf of its funders and donors based in the US and NATO neocolonialist “regime change” command centres. Funded to the tune of over $60 million by the US, UK and EU member states, these mercenaries in beige clothing have a base of operations in Turkey, but appear to operate exclusively in terrorist-held zones in Syria, and can also be seen running ‘mop-up’ operations for Al Nusra Front and other terrorist fighting groups. The ‘White Helmets’ documentary premiered today at the Toronto International Film Festival, and on Netflix streaming website. STOP SUPPORTING TERRORISTS. The so called White Helmets are a transparent construct of NATO to take over Syria by stealth in the guise of “do gooders”. NO serious journalists who have been to Syria believe they are doing what this film suggests. Only journalists too lazy to think for themselves believe this. NO locals in Syria have seen these white Helmets in their white helmets – except when their very expensive cameras turn up to film them for propaganda. And shame on any news outlet who has bought any of that footage and bought their story hook line and sinker without investigating their known connections to Al Nusra and Al Qaeda.Syrian men trying to really save children are hindered from doing so by inhumane sanctions and by the White Helmets blocking roads and villages. Local heroes have no supplies, they do not have a 90 million pound budget to get food, and first aid or digging equipment, yet nobody makes a film about these people… the real Syrian people. Local people say these are mercenaries who wear ordinary clothes, are not Syrian, and are committing atrocities and keeping food and supplies from reaching cities and villages. Paid terrorists loaded with weapons and supplies and a 90 million pound budget from EU and NATO countries who have an obsession with illegally deposing an honestly elected president of a nation state. It is another way to take over a regime… without using bombs.. by stealth, this is a Trojan Horse and these men are not heroes at all but murderers and thieves. ASK THE PEOPLE OF SYRIA. GO TO SYRIA and see for yourself. Do not just use footage made by terrorists and spread it all over the world when it is the opposite of the truth. The white helmets are a media blitz project created by the US & UK in which they received monies from the state department & billionaires who made their fortune in the oil and gas industry. 21WIRE will be bringing you more detailed reports on the funding of the Netflix operation and of course further information on the REAL Syria Civil Defence that journalist Vanessa Beeley has recently met with and interviewed in Syria – in Aleppo, Lattakia, Tartous and the Head Quarters in Damascus.